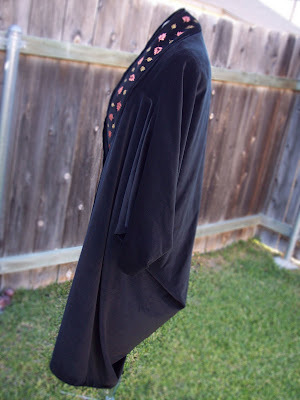 Today I am proud to preview my latest experiment--a recreation of a 1923 Poiret Cocoon Coat! I have yet to get the button closure on it, but I am terribly excited about where this is going... 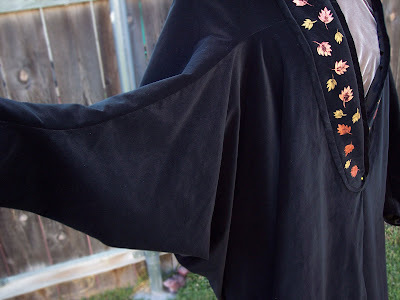 I have longed to do something elegant and drapey like this for a long time, and think that my floral painting might look really good on it, especially around the hem up to the sleeves. 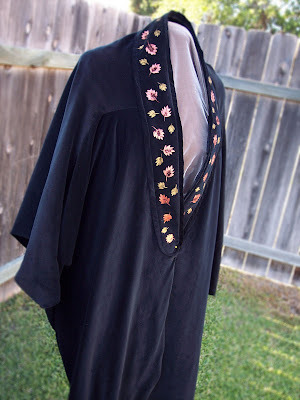 This was made out of black velveteen using a pattern: Folkwear #503. Lovely! I can see some vertical panels in the back but in a fan pattern, narrow at the bottom and wider at the top and shoulders (if that makes sense) and perhaps a band at the sleeve(cuff). I don't know that that would make it contemporary, maybe just complicated. Sorry, not much insight today. and thanks for the book recommendations, will look to see if the library has them. You know, I mirror this blog on Wordpress, posting the exact same information in two different forums (it's easier for some to subscribe to Wordpress and others to Blogger). And one of the comments over there said something very similar to what you mention... Instead of panels, she suggested slashing, with a contrasting lining on the inside, essentially creating panels in essence. I think I'm gonna have to try somethin' like that--and definately for SURE the cuffs. That'd really "tailorize" it, don'tcha think? : ) Thanks for the awesome advice, Lola! If you have any question about pattern drafting, let me know. Perhaps that could be a good tutorial? !